Your body is the vehicle that takes you where you need to go. And just like a vehicle, it needs some maintenance now and again. You need to fill the tank, change the oil, rotate the tires, and even give it some lubrication. 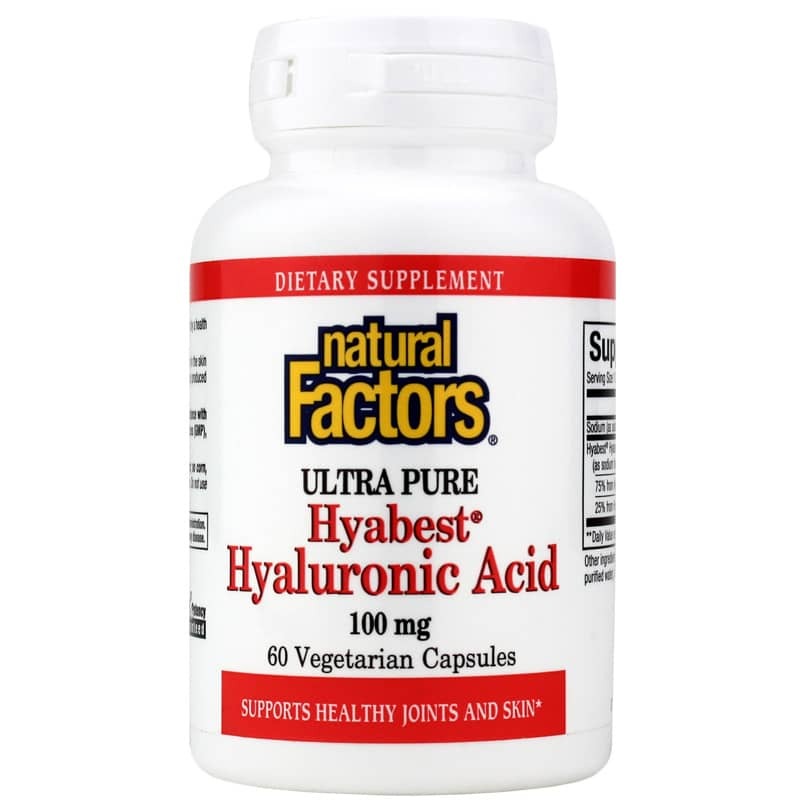 For healthy joints and skin, keep your body lubricated with Ultra Pure Hyabest Hyaluronic Acid from Natural Factors. Ultra Pure Hyabest Hyaluronic Acid is a joint and skin support supplement made with pure, high-quality Hyabest hyaluronic acid to naturally promote healthy tissues. A natural lubricant in the body, hyaluronic acid is present in large quantities in skin and cartilage. This compound promotes normal moisture content for supple skin and fluid motion in joints. Supplementing the body's natural supply of hyaluronic acid may help support healthy, youthful skin and joints for a body that looks and feels great. Natural Factors' unique Hyabest formulation of hyaluronic acid is of the best quality, combining two forms through a fermentation process for an effective range of support. 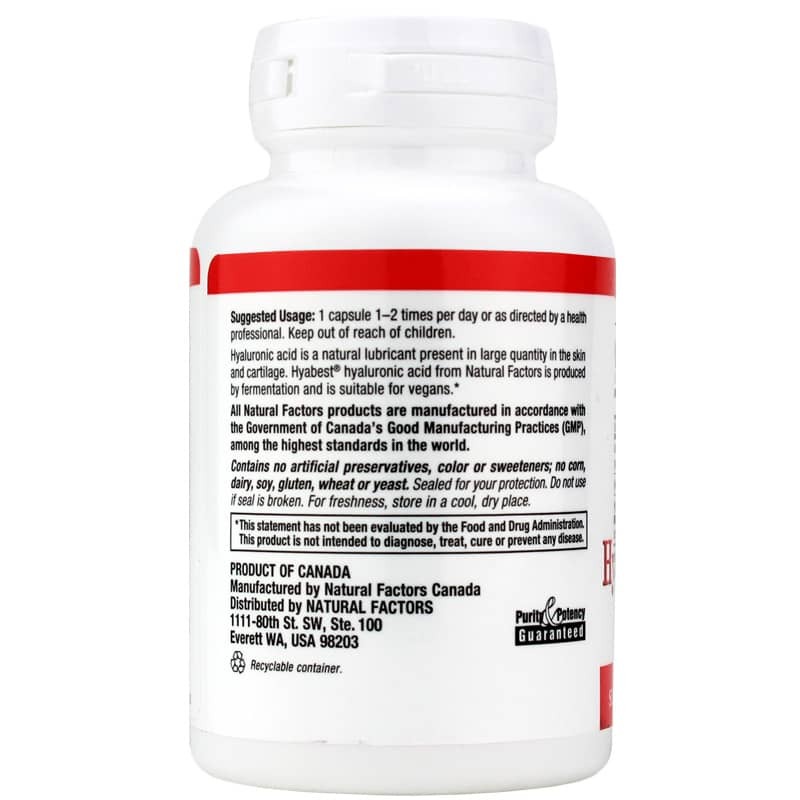 What's more, Ultra Pure Hyabest Hyaluronic Acid is manufactured in accordance with Good Manufacturing Practices as well as the FDA and Health Canada. It's suitable for vegetarians and vegans and is also free of corn, dairy, soy, gluten, wheat, yeast and artificial preservatives. For your best skin and joints, choose the best. Choose Ultra Pure Hyabest Hyaluronic Acid. Other Ingredients: cellulose, vegetarian capsule (modified cellulose, purified water), magnesium stearate (vegetable grade). Contains NO: corn, dairy, soy, gluten, wheat, yeast, artificial preservatives, colors or sweeteners. 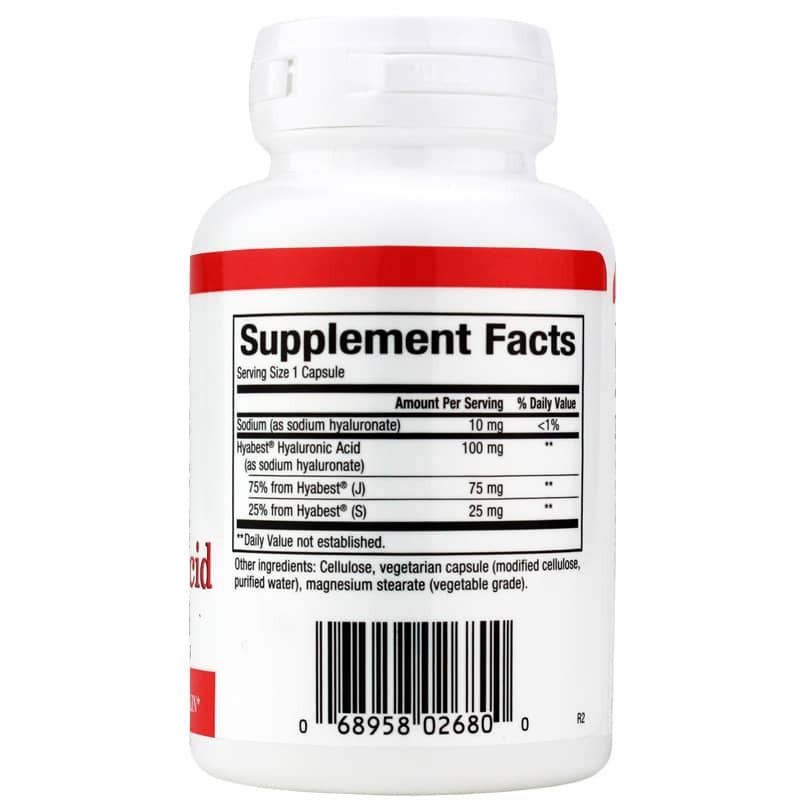 Adults: 1 capsule 1-2 times per day or as directed by a healthcare professional. There is a Japanese study where people took this brand 2 tabs daily and it showed improvement in knee osteoarthritis. This is why I use it. NCBI has studies that show this as well as it helps with wrinkles. Hyaluronic acid is anti-inflammatory. Foods rich include shitaki mushrooms, tofu, miso, and seaweed. Also, eat miso soup 3 times a week.